Rangers will be without Daniel Cousin for Saturday's match with Kilmarnock after the Scottish Premier League declined to register the striker. Cousin arrived in Scotland last weekend intent on rejoining the club he played for nearly four years ago. But the SPL imposed a transfer embargo on Rangers as well as deducting 10 points for going into administration. Rangers have the right to appeal against the decision to the Scottish Football Association. The Ibrox club announced on Monday that a deal had been done for 35-year-old Cousin, subject to international clearance. However, they went into administration the following day, carrying automatic restrictions on registering players with the league. And a statement from the SPL says they were "presented with a contract between Daniel Cousin ("the Player") and Rangers FC dated 17 February 2012, signed by the Player and by Paul Clark, the Joint Administrator of The Rangers Football Club plc (in Administration)". It added: "In terms of SPL rule A6.20, the consent of the board of the SPL was required for the registration of the player with the SPL. The board of the SPL declined to give that consent. "Accordingly, the player is not registered with the SPL and is not eligible to play in SPL matches." Rangers manager Ally McCoist had been hoping to sign Cousin to replace top scorer Nikica Jelavic, who moved to Everton on the final day of the January transfer window. Cousin, who joined Rangers from Lens in 2007, was a free agent after spending last season in his homeland with Sapins following a spell with Larissa in Greece but impressed for his country during the Africa Cup of Nations. 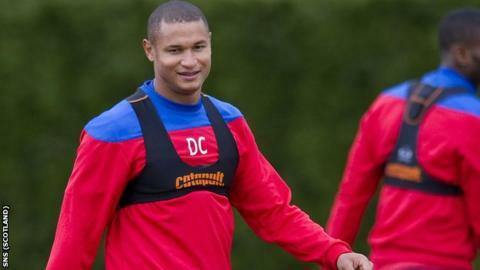 "Daniel Cousin is shellshocked at the moment, like the rest of us," said McCoist prior to the SPL announcement. "At this moment in time he is in the squad and still has an opportunity of getting the signing through. I'm still very hopeful we can get through the bits of red tape. "The players still want Daniel to come, we still want Daniel to come and the support want Daniel to come. Most importantly, Daniel still wants to be involved here."